Recipe from Dr. Glennis Orloff, Program Director - New Products, Intuition Women's Razor System, Schick-Wilkinson Sword and Energizer Company. 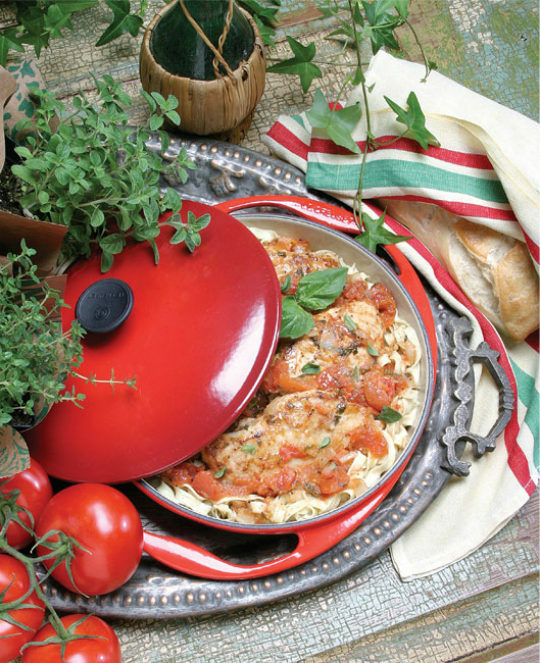 Who doesn't love an Italian-inspired hearty meal? Here's a healthier take on a classic favorite. Yes, it's high in calories, but consider that, if eaten with a simple green salad, your entire meal will still be reasonable in calorie count. Season breasts with pepper (and a little sea salt if desired) and brown on each side. Sauté onion and garlic in olive oil for 4-5 minutes in a skillet. Add pepper, tomatoes, oregano and wine and bring to a boil. Cook about 10 minutes until sauce thickens. Add in chicken; cook another 10-15 minutes turning chicken until it is done. Serve over pasta (approximately 1/2 pound, before cooking) or rice (approximately 1 1/2 cups before cooking).